The central message of the Word of God is the Cross of Christ. 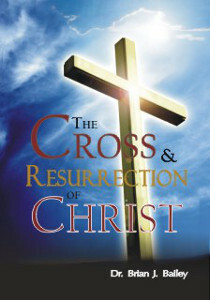 Dr. Bailey has reverently approached this study of the Cross of Christ and beautifully portrayed the love, wisdom, and humility of our Lord displayed in this event. This anointed little book considers the sufferings of Christ upon the Cross in order to gain a deeper understanding of one of the holiest events in the history of mankind that we might develop a greater love and appreciation for what the Lamb of God has done for us! Dr. Brian J. Bailey was president of Zion Fellowship International, Zion Ministerial Institute, and Zion Christian University for over thirty years. In his fifty year ministry he traveled to over eighty countries ministering in churches, seminars, and Bible schools. Dr. Bailey has also authored over sixty books, teaching believers the ways of God and how to become established on the pathway of holiness that leads to spiritual Mount Zion.